The continuing expansion of the Tauranga marine industry, along with the opening of the exciting new Tauranga Marine Precinct, has seen Lusty & Blundell Ltd move their Tauranga branch into new, larger premises at Sulphur Point. 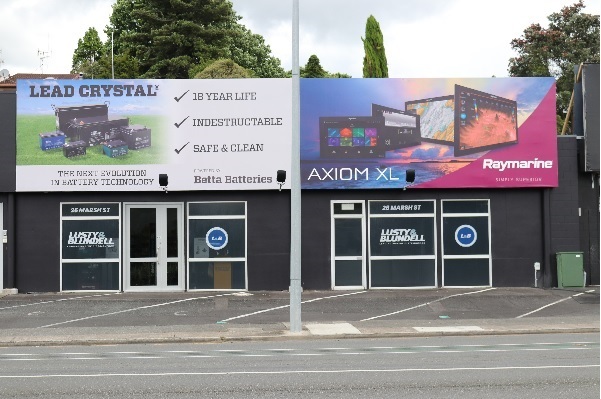 L&B’s new Tauranga branch, at 26 Marsh Street, is a full support and supply centre for L&B and its large range of world-leading marine systems. These include popular high quality brands such as marine electronics brands Raymarine and Vesper AIS; Ocean Signals’ rescueME safety range; Xylem’s Jabsco and Rule pumps and water handling solutions; Muir winches; Westerbeke generators; Steelhead cranes; Blue Sea Electrical components; Betta Lead Crystal Batteries; CTEK battery charging and monitoring; Ultraflex steering solutions: Naiad Stabilizers and a large range of electrical cable, to name just a few. Tauranga branch manager Morgan Brodie says the handy new location, new, longer opening hours and larger service facility will allow L&B to better service the area’s continually-expanding marine industry and its growing number of commercial and recreational boaties and fishers. L&B’s new Tauranga branch at 26 Marsh St opened on November 12. It is open Monday to Friday from 7.30am to 5.00pm and the team can be contacted at (07) 927-9270.